There has been a bit of Ulysse Nardin activity in Australia in recent times, with the appointment of a new Brand Director, Jean Conrie, and a dinner celebrating the brand with serving Royal Australian Navy Commanders and Officers as guests of honour. Amidst all of this was an offer to lend Horologium a watch for a few weeks, and of the ones offered to me I decided on this, the Executive Dual Time. 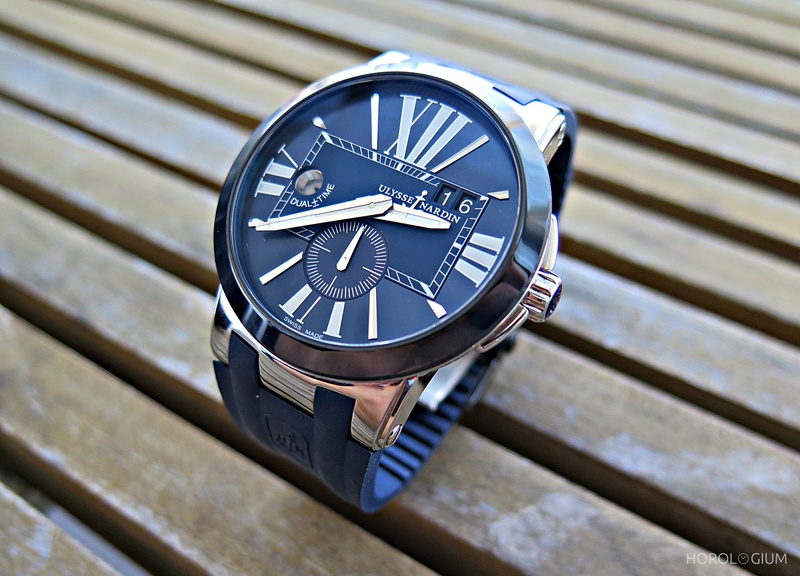 This is not a new model but it is in their existing collection; I chose it both because we’ve dealt with a number of time zone-oriented watches this year and because it’s perhaps a lesser known Ulysse Nardin, its look not as distinctively ‘Nardin’ as their other more recognisable offerings. The ‘Executive’ collection focuses on functionality, and time zones form a key part of this line. This is a dress watch, albeit a sporty one on this rubber strap. I know that many prefer their dress watches to be smaller than their sports watches; the Dual Time is in a 42mm stainless steel case that sits smaller than that. With the thinness of the ceramic bezel and lug design it not just looks like but also sits more like, between 40-42mm. Water resistant to 100m this is a glossy watch with a lot of polishing, but it is not overly shiny. It is also very legible, but in terms of the extended numerals that are popular amongst a number of brands and more importantly, the size and legibility of the magnified second time zone indicator at 9 o’clock. The dual time function used in this watch is one that Ulysse Nardin likes to use and has been using for a number of years. It forms part of the automatic Calibre UN-24, which is a modified base ETA 2892. Reliability is pretty much guaranteed. A key feature of the date adjustment is that you can adjust it backwards and forwards, which makes it faster to do. When you change the time on the dial, both the time in the 24-hour dual time window and the dial time will adjust. The two pushers at 8 o’clock and 10 o’clock are a quick-set way of quickly changing the main (local) time back and forth, which makes it easy to change not just when travelling but if say you don’t wear the watch for a day or two, as I did during my loan period. You will note how highly polished the deployant buckle is, in line with the tone of the watch. It is secure, opened via the classic push button design, and sits well under the wrist size-wise. The rest of the strap, once I became accustomed to the novelty of the smell of the rubber strap (vanilla) is also comfortable; it’s fairly soft, and not one of those lug-and-rubber-strap combinations which are a bit stiff and not suited to all wrists. An interesting feature of Ulysse Nardin watches which some of you may not know about is this plate, on the side of the watch. It doesn’t connote a limited edition but personalises the watch with its own serial number. A lovely touch. The Australian RRP for the Ulysse Nardin Executive Dual Time is $12,600.